One Perfect Bite was featured in the Sunday Brunch Segment of Amuse Bouche, the blog associated with the magazine Where Women Cook. It you're interested, the feature can be seen here. I'm fairly even tempered and it takes a lot to move me from cold to hot. That's not to say I don't have a pet peeve or two, and, as it happened, a couple of them surfaced today. One is the accumulation of unfinished cereal sitting in boxes that are only fractionally full. That happens a lot around here because each member of my family has a favorite all their own. That favorite is generally unfinished at the end of a visit, so, to my great shame, you'll occasionally find Cocoa Puffs or Fruit Loops floating in my cereal bowl. Generally, the assortment stales before I can work my way through it and I'm left feeling guilty because I have to throw it away. That happened this morning. Another peeve surfaced this evening while the table was being set for dinner. I think we all have a vision of what we consider to be gracious living. Mine does not include a collection of jars and bottles sitting in the center of the dinner table. In my dream world, salads are tossed in the kitchen and graciously served from a bowl at the table. The Silver Fox doesn't share my vision. So, it happens that an assortment of condiments and dressings got to claim space at my table tonight. Among them was the Vidalia onion dressing I used to make peanut sauce earlier in the week. 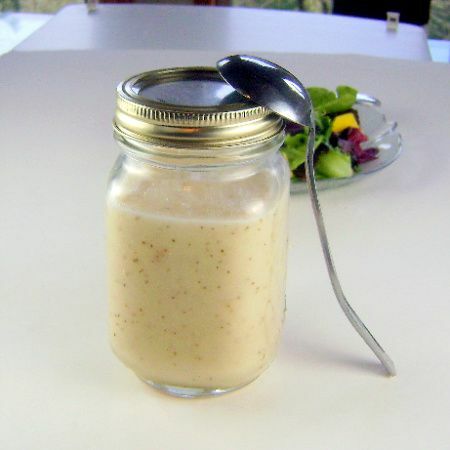 One of the advantages to making your own condiments and dressing is that you can control the amount you make by sizing the recipe for them up or down. I normally make half the recipe because that's sufficient for our needs. While I make this to use in peanut sauce, it's also wonderful on bitter greens and fresh fruit, so I have plenty of opportunities to use it and it will not go to waste. 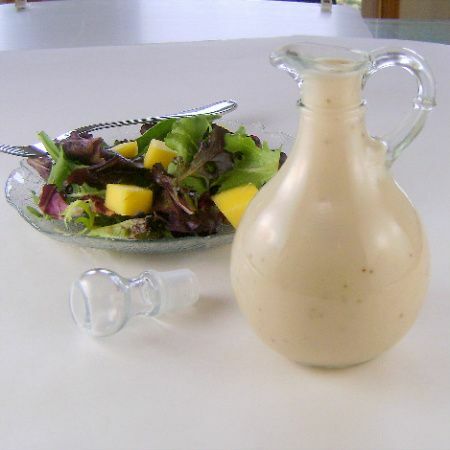 The dressing is embarrassingly easy to make, but I do have one serious caution. The Vidalia is a sweet onion. While other sweet onions can be used to make this, don't make the mistake of thinking all white onions are sweet. Ask the produce manager if you are not sure. If you make this with anything other than sweet onions it will be dreadful and you'll speak of me using adjectives I'd prefer you not. REMEMBER SWEET ONIONS. Here's the recipe. 1) Slice 1/2 inch off both ends of onion. Pierce onion skin in several places with a sharp knife. Place onion in microwave-proof bowl. Add a tablespoon of water and microwave, covered, on HIGH power until soft, about 3 to 4 minutes. Set aside to cool. 2) When cooled, peel and place in food processor. Puree until smooth. Add oil, vinegar, sugar, mustard, garlic powder, celery seed, salt and pepper and process until smooth. Chill. Yield: 1-1/2 cups.